BRAND NEW: Pineapple Dried Fruit Platter,$49.99: How gorgeous is this gift? And healthy, too! Thirty ounces of top-of-the-line dried fruit is beautifully arranged on a pineapple-shaped bamboo cutting board. The dried fruit includes pineapple, cherries, plums, apricots, dates, plums, kiwi, pitted prunes and apple rings. In the 1700's, the pineapple was the ultimate symbol of hospitality. This modern version of the pineapple gift is sure to evoke similar feelings of warmth, community and camaraderie. Great hostess gift, too! BRAND NEW: A Must-Have For The Football-Loving Dad: NFL-Themed Popcorn Tins, $59.99:Tailgate in your family room with these attractive, branded tins reflecting the passion behind several top teams. Currently, GourmetGiftBaskets.com has very colorful, three-gallon tins for fans of nine different teams: New England Patriots, Denver Broncos, Dallas Cowboys, Pittsburgh Steelers, Philadelphia Eagles, Seattle Seahawks, New York Giants, Green Bay Packers and the New Orleans Saints. Some of the most popular flavors for men are included in each tin -- Kettle Corn, Cheesy Cheddar and Caramel Popcorn. BRAND NEW: Perfect for Baseball Fans! MLB Popcorn Tins, $59.99: Tins emblazoned with team-specific images are available for fans of the Boston Red Sox, New York Yankees, New York Mets, Detroit Tigers, Cleveland Indians, Chicago Cubs, LA Dodgers, San Francisco Giants, and the St. Louis Cardinals. Kettle Corn, Cheesy Cheddar and Caramel Popcorn are the featured flavors in these tins, as well. WANT SOMETHING REALLY CHRISTMASY? You can’t go wrong with this beautiful (and new) Christmas Classic,$69.99 or the Good Tidings Holiday Gift Basket,$59.99. BEER AFICIONADOS REJOICE: This Beer Bucket is the perfect collection of brews for you! Fall Seasonal Beer Bucket,$69.99. WANT SOMETHING THAT’ S CELEBRATORY BUT NOT RELIGIOUS? Say "Hello" to the Winter Wonderland Gift Basket,$59.99. For People Who Just Love Baked Goods Like Cookies & Brownies -- Check these affordable gifts out! Let It Snow Cookie Box, $29.99, and its confectionery "cousin" the Let It Snow Brownie Gift Box, $29.99. Desserts Reincarnated As Popcorn -- Holiday Gourmet Popcorn Sampler, $34.99 -- This is a true WOW gift for the popcorn aficionado and the dessert lover on your list. It features handcrafted, fresh popcorn reflecting many past and modern holiday cookies and desserts. Flavors include: Gingerbread Spice, Dark Chocolate Peppermint, Eggnog, Cinnamon Bun, Anise Cookie, Dark Chocolate Orange, Pink Himalayan Sea Salt Caramel, and Milk Chocolate Drizzle. Holiday Dinner Popcorn Sampler, $34.99 -- Imagine 10 different gourmet popcorn flavors in a box designed to reflect everything on the table at a traditional, homemade holiday dinner: Turkey, Stuffing, Gravy, Garlic Mashed Potatoes, Herb Roasted Vegetables, Buttered Corn on the Cob, Cranberry Sauce, Pumpkin Pie, Apple Pie, and Strawberry Cheesecake. How cool would this be as a housewarming gift over the holidays? 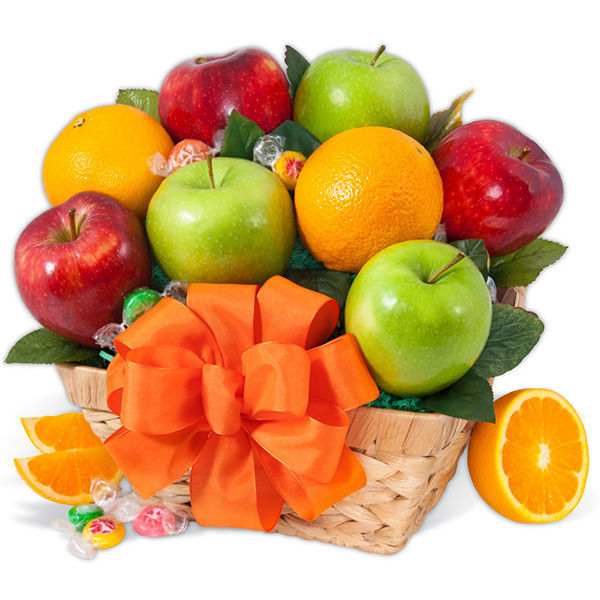 SUPER Healthy Holiday Offering -- Christmas Fruit Gift Basket, $39.99: If you have a friend or loved one who's dedicated to fitness and healthy eating above all else, this is a thoughtful and very budget-friendly gift. Wonderful orchard fruit picked at the height of freshness (plus a couple of fruity candies) make up this wonderful, refreshing Christmas basket. Also, this beauty is a favorite among women who want their men to be much healthier -- even at the holidays. Enter to win! 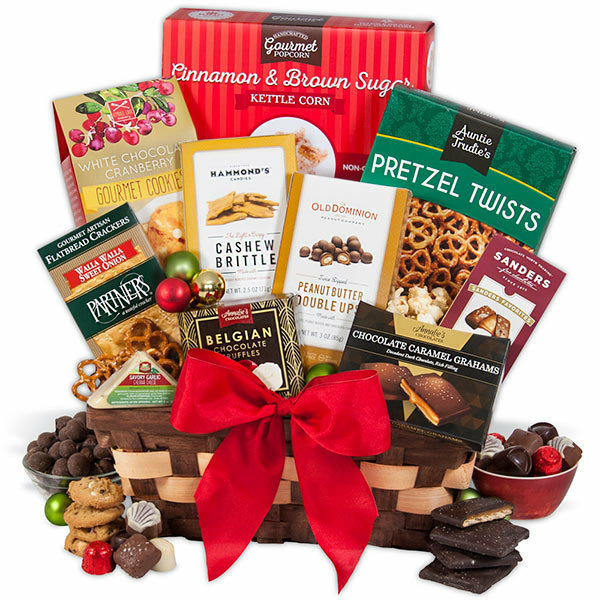 One winner will receive a GourmetGiftBasket.com gift basket of their choice up to a $70 value. I know someone who would love the Gourmet Meat & Cheese Sampler - Deluxe. I would like the Christmas Gift Basket Classic. I would choose the Christmas Gift Basket Classic. I would choose the Holiday Gourmet Popcorn Sampler. I love the Orchard's Abundance. The from the bakery gift tower!! I think I'd go with the Christmas Classic! I like the Christmas Gift Basket Classic. I would love to get the Chocolate Gift Basket Classic. 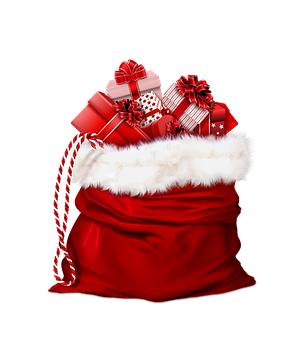 I would love the Christmas Gift Basket Classic! I would pick the around the world beer bucket! I would pick the Red Wine & Dark Chocolate gift basket. I would choose the Kosher Gift Basket Classic. I would love to win the Christmas Classic! I would pick the Christmas Classic basket. I would get the Baked Goods Premium Gift Basket for my girls. Thank you! I would choose the From The Bakery Gift Tower! Everyone in my family would appreciate the Mendocino County Gift Crate. I would choose the Winter Wonderland because of the chocolate! I would choose the Christmas Gift Basket Classic, it has a nice variety in it. Holiday Gourmet is the one I would love to have. Thanks for chance. I would get the From The Bakery Gift Tower. I would choose the Classic Christmas Basket. I would choose the Good Tidings Holiday Gift Basket. Tour Of Italy - Italian Gift Basket. I'd choose the basket with chocolate in it! You can't go wrong with chocolate. I would chose the Fall Seasonal Beer Bucket. I would love to have the Christmas Morning Breakfast Gift basket ! Or the Winter Wonderland looks pretty nice :) <3 them all !! I like the Winter Wonderland Holiday Gift Basket! those are two things that I absolutely LOVE together. I love to indulge on the weekend. OMG I would love the popcorn sampler! I may choose the Snack & Chocolate Gift Basket - Classic. My choice would be the Christmas Gift Basket Classic. I would choose the Gourmet Meat & Cheese Sampler. I'd like to get the Chocolate Gift Basket Classic.